For me, it will always be the wonderful “musical montage” in “Easter Parade.” It begins in the film, when Fred Astaire decides to not change Judy Garland’s performing image and the situation turns itself into a series of marvelous musical numbers, as the pair embark on their raise to Broadway stardom! Some of the songs were legendary Irving Berlin standards that had not been heard in years, magnificently revived in the movie. The montage splendidly gets under way as Fred and Judy perform to the tune, “I Love A Piano.” This is a truly one of the most momentous moments in movie musical history, as Fred takes Judy into his arms and they dance into an exquisite “two-step” routine. Then comes the zany little tidbit romantic ballad, “Snookey Ookums!” This is followed by one of my favorite Berlin tunes of his early period, the upbeat “Ragtime Violin.” Finally, the montage ends with the famous exhilarated, elegant performed Berlin tune, “When The Midnight Choo-Choo Leaves for Alabam!” Judy and Fred end it all on a high-note of dancing delight. This is without any question, one of the most cherished, admired, influential musical films of its kind. They just don’t make this sort of classic musical film any longer and it will most likely never be topped. So, for all the Music lovers remember or look up July 1 (2012) for a great day. Musicals, in general, are a fabulous and fascinating kind of theatre, due to the fact that they often have singing, speaking and, in some cases, even dancing. 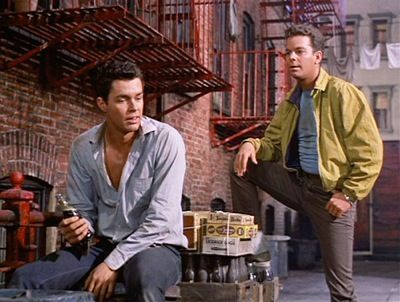 West Side Story--on both screen and stage. My all time favorite movie--hands down, as well. My Fair Lady; the movie was okay, but I liked the stage version a great deal better. I liked the "With a Little Bit of Luck" number. Sound of Music: inspired by an intense but true story, this too, is a very good movie musical. I never saw it live, however. The song, Climb Every Mountain is my favorite song in the whole movie, because it delivers a powerful message of how one needs to believe in him/herself, look for and follow their dreams, and when they find their dreams, give them all the love one has. Mary Poppins: Never saw it on stage, but it was a fun film, nonetheless. I saw the movie in the 8th grade, back in the fall of 1964. Godspell: Saw the stage play of Godspell twice; once here in Boston and the other time in London. A fun musical all around. I didn't like the movie version of Godspell very much, however. Showboat: Another beautiful musical. Saw the stage play in London many years ago. The song "Ole Man River" was my favorite moment in "Showboat". I also saw a TV airing of the 1930's film version, with a young Paul Robeson in it. That was good, also. Hair: Saw both the stage and the film version. Both were lots of fun. I like the Cowsills' rendition of the song "Long Beautiful Hair". Mamma Mia: Recently saw the stage play here in Boston with my niece and my sister-in-law, at the Boston Opera House. I enjoyed it a great deal. I liked the song "Dancing Queen" by the Swedish rock group, Abba. Brigadoon: Never saw the movie, but I did see the play in NYC many years ago...and enjoyed it immensely. Oklahoma: Saw the stage play of Oklahoma twice; once back in the early 1960's, and once 13 years ago, in a revival of it, both here in Boston. I enjoyed this musical overall on stage. "Oh what a beautiful morning" and Many a New Day are my favorite songs in this musical. The 2004 Broadway revival of it wasn't very good, but the stage version that I saw back in the early 1960's was fabulous. Wasn't too crazy about the film version, however. Both Fantasias: They were beautiful overall, but I especially liked the Night on Bald Mountain and the Rite of Spring in the original 1940 Fantasia, and the "Firebirds" in Fantasia 2000. I like the ​True Love sequence in High Society​. Bing Crosby and Grace Kelly are reclining languidly on the deck of the sailboat while he sings that beautiful song and, even though you can tell it was filmed in a studio tank, it's a magic moment. I've always liked the scene in "Kismet" when Ann Blyth and Vic Damone sing "Stranger in Paradise". Not only do their voices blend so well, but it's such a beautiful setting. They certainly did not skimp on the color in that scene.